I first heard of the Lincolnshire Wolds as a member of the YHA, hearing talk of the iconic Woodys Top Youth Hostel. It took another 20 year for me to get around to visiting this quiet and beautiful area of the UK, by which time Woodys Top hostel had closed and there were few iconic simple hostels left in the YHA. I stayed with friend at the Viking Centre Hostel, an independent hostel on the Eastern fridge of the Wolds, about 30 minutes drive from the location of Woodys Top Youth Hostel. The Lincolnshire Wolds are a truly beautiful area of countryside. The rolling wolds rise out of the flat Lincolnshire plane and a short gentle climb is rewarded with views spanning from Lincoln cathedral to the sea. There are quiet lanes along the ridges, ideal for swooping along by bicycle, and ancient pathways between villages with old thatched pubs. Undiscovered was the word that sprang to mind when exploring this area but then I came across signs that the Lincolnshire Wolds had been very much discovered nearly a century earlier. It turns out that this area was fundamental in the rambling and cycling craze of the 1930s, when city workers discovered the countryside. This epic era of outdoor recreation saw the birth of the Youth Hostel Association (YHA), the Cycle Touring Club (CTC) and many Ramblers associations, all with great ties to the Lincolnshire Wolds. Rambling, or hiking as it was then called, was front page news and each weekend the Wolds rang out to the sound of walkers singing popular walking songs. My first clue to this history of walking in the Wolds was when I spotted a sign attached to a style (pictured at the top of this page) . This sign commemorated J N Cole of the “Wanderlust and Grimsby Wayfarers”. A bit of research showed that in the early 1930’s, around the time of the mass trespass on Kinder Scout, The Wanderlust Rambling Club started hiking trips out of Cleethorpes. The Wanderlust Club was the founding organisation of the “Grimsby & District Wayfarers Association” the largest rambling club in the UK by the 1950’s, with links to the Lincolnshire Ramblers Federation, The Y.H.A. and The Footpaths Association . Later that day we came across the Ramblers Church (a ancient church on the outskirts of Walesby) which was nearly lost to ruins until it was adopted by the Grimsby Walking Club, and nicknamed the Ramblers Church. Look carefully on the photo below you can see the initial RLC anchoring support struts on the surface of the old church tower. After this I was not surprised to find a simple car park strangely signposted the Rambers Carpark on a quite road climbing the ridge over the east side of the Wolds. On what of Woody’s Top Youth Hostel? well its a holiday cottage now. Sold by the YHA a couple of years ago. It was opened in 1948, to replaced Farforth hostel, just over the fields. Its name cames from “Mr Wood’s Top Barn”, which is what it was when the YHA took it on. For many years it was extremely spartan, water being brought up a steep hill in a wheeled barrow and compost toilets. It was famous throughout the youth hostel network for its simple facilities and idyllic location. Quite though it seems, without the hordes of ramblers cascading out o the cities, the Lincolnshire Wolds remains an idyllic place for walking. The Vikings Way is an ideal long distance path ideal for exploring the area, and despite the demise of Woodys Top, the first three nights are catered for by Independent Hostels on the route. The Viking way starts on the Humber Estuary just south of Hull, easily reached by city bus from Hull Trinity Backpackers. It weaves its way along ancient footpaths through Claxby, where the Viking Centre is right on the route, and on across the Lincolnshire Wolds to continue on through Leicestershire and Rutland. A popular walking festival is held in the Lincolnshire Wolds each spring, very close to the Viking Centre. The Lincolnshire Wolds Walking Festival provides ten days of guided walks. This is a ready made walking holiday for any size of group when combined with a stay at the hostel. 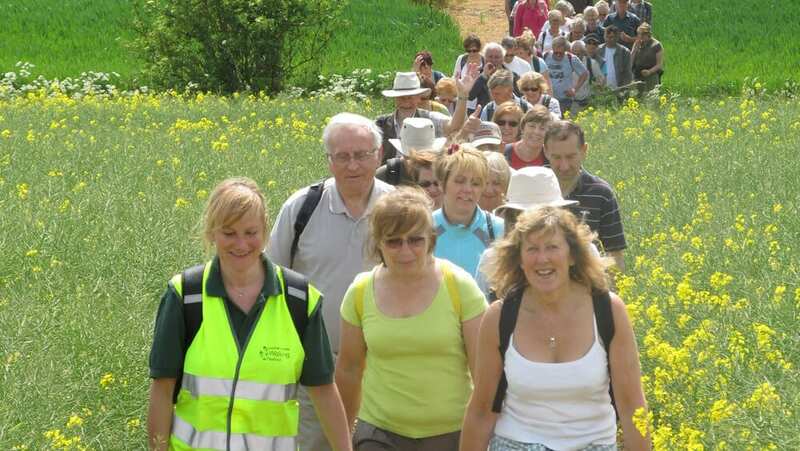 A partner festival is held each Autumn in the south of Lincolnshire, the Lincolnshire Walking Festival. Lincolnshire Wolds Walking Festival, held every spring. The Viking Centre is in the quiet, rural village of Claxby and during our stay we were surrounded by birds and wildlife. One day we were privileged to watch a wild hare race across a nearby field. It was strange to discover that Claxby and nearby Nettleton had housed industrial Ironstone mines up until the 1970’s with 6,000,000 Tons of Iron ore removed from the area. You can find out more about this in the locally published “Ironstone Mining In The Lincolnshire Wolds”. What a surprising area the Lincolnshire Wolds turned out to be, far from flat, far from undiscovered and an amazing location for walking and cycling holidays. If your interested in a holiday in this area, here is a map showing the location of the independent hostels in Lincolnshire and the East of England. Window in the Ramblers Church donated by the Grimsby Wayfarers.